My absolute agreement with MMMM #14 has only intensified over the years. Of course, I’ve felt this way for quite some time. The only thing I can’t figure out – do other collectors have started to feel the same way? I don’t have much objective data to support either argument. The only weak piece of data I can point to is the unsold BHS. It has sat unsold for months and months. Of course, there are lots of variables with that listing; everything from price to the seller. Plus, having only one data point is more likely to be an outlier instead of a trend or rule. Although some people think an outlier is the rule. I wouldn’t want to be that stupid. 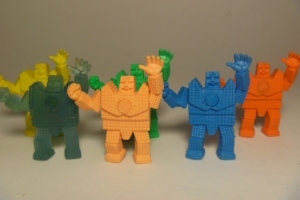 Four cool MUSCLEMANIA figures were added to the archive. Do you know what stands out to me about this post? The formatting is much better than earlier posts. I think I had finally figured out the “look” of the site (for better or worse). Lots of people may hate the #208 figure, but I’ve always loved him. Two thing jumped out at me when I looked back at AW #141: (1) the card; and (2) the catalog. I don’t think we’ve seen a card that nice in five years. I know we’ve seen some cards, but I can’t remember one that attractive. AW #141 is the last time I featured a Mattel Catalog. Five years ago. Wow. I don’t think it is because they have suddenly become rare. Although, as of writing, there are zero 1987 Mattel Catalogs on eBay and only one from 1986. Hmm, maybe that’s why I haven’t seen them. Interesting. Finally, there is the Epilogue. 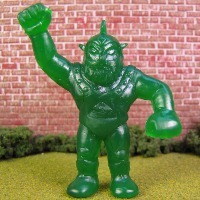 I wish I could tell Chad-from-the-past that the single figure scourge would only get worse. I wouldn’t mind telling him that the UofM/WWE gap would get worse too. The UofMUSCLE Facebook page has 298 likes, or members, or followers – whatever. 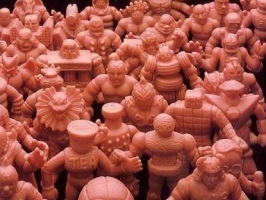 The WWE M.U.S.C.L.E. Figures has 979. Seriously? For a while there was NOTHING being posted on the WWE and it was still getting more likes. Now I just use it as an extension of UofM. I genuinely don’t care. It’s just genuinely confusing to me. This entry was posted on Saturday, August 18th, 2018 and is filed under UofM News. You can follow any responses to this entry through RSS 2.0. You can skip to the end and leave a response. Pinging is currently not allowed.